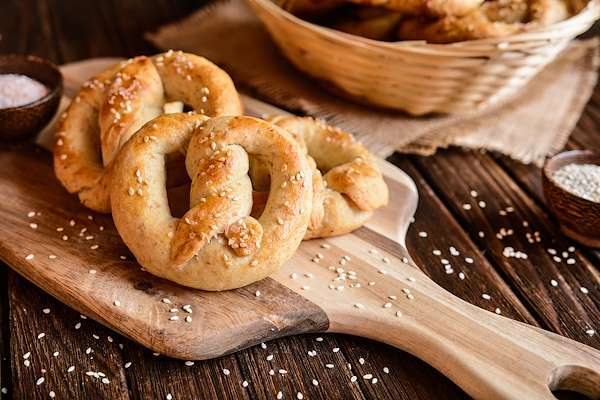 These classic soft pretzels are a tender, salty delight that are quick & easy to make from scratch. Serve them warm from the oven with a savory mustard or cheese dip. They are a delicious snack any time! RecipeSavants.com These classic soft pretzels are a tender, salty delight that are quick & easy to make from scratch. Serve them warm from the oven with a savory mustard or cheese dip. They are a delicious snack any time! Smart Recipes, European Recipes, Grains Recipes, Recipes Grains European Homemade Pretzels PT1H30M Serves 8 Ingredients: 4 Teaspoons Active Dry Yeast 0.25 Cup Pretzel Or Kosher Salt 5.5 Cups All Purpose Flour 0.75 Cup Sugar 1 Tablespoon Vegetable Oil 0.5 Cup Baking Soda In a small bowl, dissolve yeast and 1 teaspoon sugar in 1 1/4 cup warm water (about 110 degrees). Let stand until mixture is foamy, about 10 minutes. In a stand mixer, combine flour, remaining sugar, table salt, oil, and the yeast mixture. Mix until a dough forms. Knead the dough in the mixer until smooth & elastic, about 7-8 minutes. Alternately, turn dough out on a lightly- floured work surface and hand knead dough for about 10 minutes. Lightly oil a large bowl, place the dough in the bowl, and turn to coat with oil. Cover with plastic wrap and let rise in a warm place until doubled in size, about 1 hour. Preheat oven to 450 degrees. Coat 2 sheet pans with cooking spray and set aside. Meanwhile, bring 4 cups of water to boil and add baking soda. Stir untill the baking soda is dissolved. In a large saucepan over medium-high heat, add water, stir in baking soda, and bring to a boil. Turn dough out onto a lightly- floured surface and divide into 12 equal pieces. Roll each piece into a rope and twist into a pretzel shape.With tongs, dip each pretzel into the boiling baking soda solution and arrange them on baking sheets. Sprinkle with pretzel or kosher salt. Bake until puffy and golden brown, about 8-10 minutes. Place pretzels on wire racks to slightly cool. Serve warm. If you enjoyed this recipe, try some of these yummy snack ideas! Here is one of my favorite snacks prepared in a healthy way! This quick & easy recipe features store-bought tortilla shells cut into wedges and baked to a golden crisp—no deep-fryer needed. 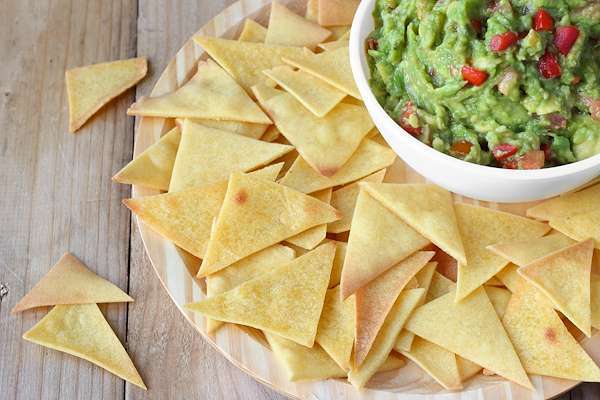 Season them with salt, cumin & chili powder and enjoy with your favorite Mexican-inspired dips. It's easy and convenient to make your own dim sum-style bread at home using the following simple instructions. 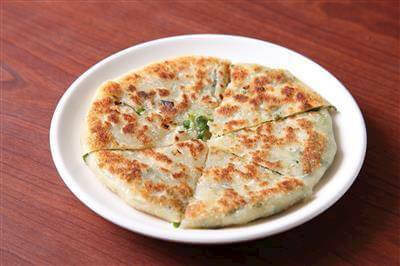 Brown rice flour makes it crisp while the green onions flavor every bite of this soft bread. 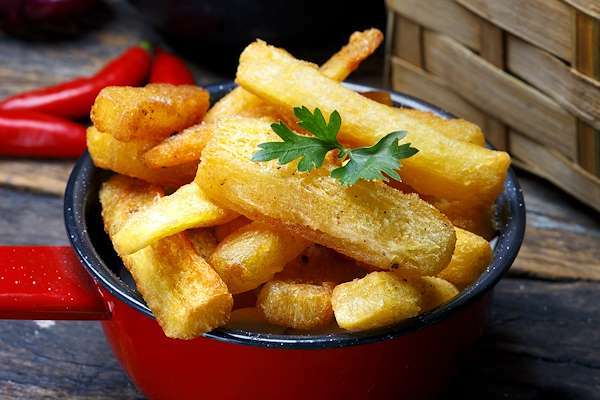 Yuca is a starchy root from which tapioca is made. This enticing Cuban dish recipe is a perfect appetizer or a snack for parties at home. 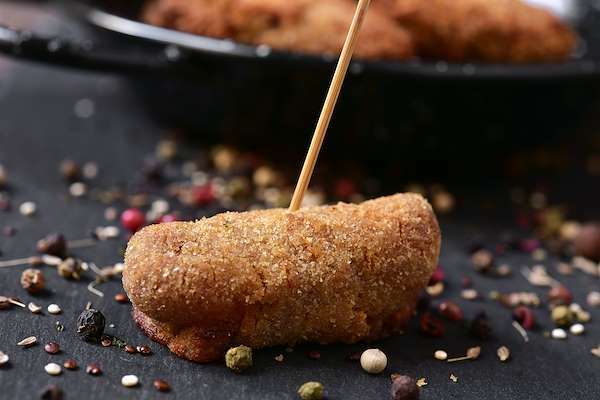 These melt-in-your-mouth Spanish croquettes have a creamy filling that leaves you wondering if you are eating ham flavored mashed potatoes or a ham and cheese blend. Whereas, you will be surprised to know it’s neither. These simple croquettes are made with flour, milk, butter and ham – flavored with onion and nutmeg. Serve with your favorite dipping sauce.